Irvine, Calif., March 7, 2017 — Chemists at the University of California, Irvine have developed a way to neutralize deadly snake venom more cheaply and effectively than with traditional anti-venom — an innovation that could spare millions of people the loss of life or limbs each year. In the U.S., human snakebite deaths are rare — about five a year — but the treatment could prove useful for dog owners, mountain bikers and other outdoor enthusiasts brushing up against nature at ankle level. Worldwide, an estimated 4.5 million people are bitten annually, 2.7 million suffer crippling injuries and more than 100,000 die, most of them farmworkers and children in poor, rural parts of India and sub-Saharan Africa with little healthcare. "Current anti-venom is very specific to certain snake types. Ours seems to show broad-spectrum ability to stop cell destruction across species on many continents, and that is quite a big deal," said doctoral student Jeffrey O'Brien, lead author of a recent study published in the Journal of the American Chemical Society. 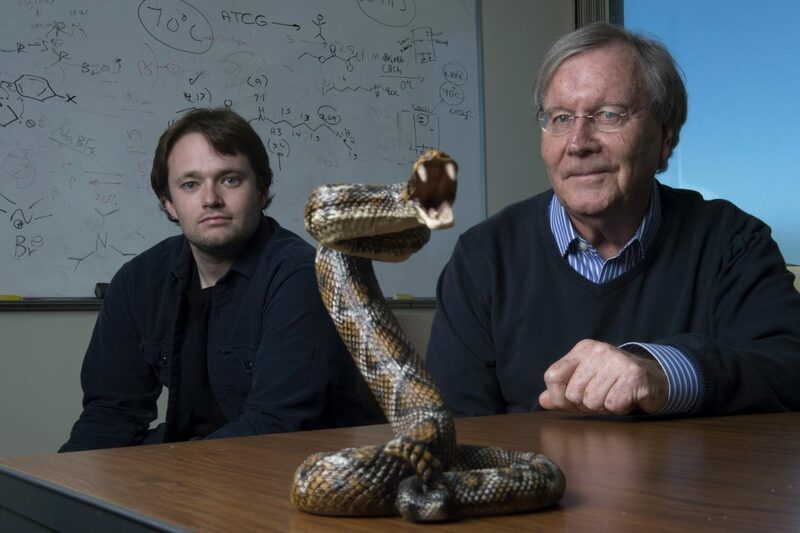 Zeroing in on protein families common to many serpents, the UCI researchers demonstrated that they could halt the worst effects of cobras and kraits in Asia and Africa, as well as pit vipers in North America. The team synthesized a polymer nanogel material that binds to several key protein toxins, keeping them from bursting cell membranes and causing widespread destruction. O'Brien knew he was onto something when the human serum in his test tubes stayed clear, rather than turning scarlet from venom's typical deadly rupture of red blood cells. Chemistry professor Ken Shea, senior author of the paper, explained that the venom — a "complex toxic cocktail" evolved over millennia to stay ahead of prey's own adaptive strategies — is absorbed onto the surface of nanoparticles in the new material and is permanently sequestered there, "diverted from doing harm." Thanks to the use of readily available, nonpoisonous components, the "nanodote" has a long shelf life and costs far less. The existing antidote is made by injecting horses with venom, waiting weeks for the animals to develop antibodies, then extracting their blood and shipping it from Mexico or Australia to places that can afford it. The process is not allowed in the U.S. Major suppliers have discontinued shipments to many markets. In contrast, "our treatment costs pennies on the dollar and, unlike the current one, requires no refrigeration," O'Brien said. "It feels pretty great to think this could save lives." Since publishing their findings, the researchers have discovered that scorpion and spider bite infections may also be slowed or stopped via their invention. They have patents pending and are seeking public and private funding to move forward with clinical trials and product development. Additionally, Shea's group pioneered a synthetic antidote for bee melittin — the ingredient in stings that can kill people who have an allergic reaction — using similar methods. "The goal is not to save mice from venom and bee stings," Shea said, "but to demonstrate a paradigm shift in thinking about solutions to these types of problems. We have more work to do, and this is why we're seeking a fairly significant infusion of resources." The U.S. Department of Defense's research arm financed the first phase of the laboratory work. "The military has platoons in the tropics and sub-Saharan Africa, and there are a variety of toxic snakes where they're traipsing around," Shea said. "If soldiers are bitten, they don't have a hospital nearby; they've got a medic with a backpack. They need something they can use in the field to at least delay the spread of the venom."